I made a promise to myself that I would try any new food again, even if it was something I thought I hated or had never tried before. And thanks to the classic beetroot salad I now know I love beetroot! I can even easily eat zucchini and celery now because I can just chop it up as much as I want to in my Thermomix and hide other veggies when I need to. So if there are any fussy eaters in your life just know that there is hope. That demo in October also changed my life because I made the choice to become a consultant. I had been very unhappy in my full-time job and unsure what to do. I had been on a complaints handling course the day before and the facilitator had told me I was in the wrong job. I already knew that but I didn’t know what I wanted to do. Then during that demo my consultant Anne started talking about how you can become a consultant and earn your Thermomix. It was like a light bulb moment for me. A sign from the universe. And Interest Free finance was on offer so it was even easier for me to purchase my Thermomix and start my Thermomix business. It’s actually even easier right now with the free business kit on offer until 31 October 2015 AND 24 months Interest Free finance starting on 16 October 2015. This is the first time this has ever been offered! Please contact me if you would like some more info or go to the Thermomix website here. So that was where I was at a year ago. I hadn’t realized a year had passed until I started writing this blog post! 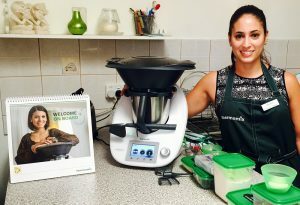 I didn’t receive my Thermomix until just before Christmas (there was an 8 week delay due to the high level of demand) and I didn’t start as a consultant until January 2015. I hope you have enjoyed reading about how my Thermomix changed my life. Please post any comments below. I’d love to hear when you purchased your Thermomix, why you purchased it, how it’s change your life and even what you’ve called your Thermie!